"Demob" redirects here. For the television series, see Demob (TV series). For the British punk rock band, see Demob (band). For the house music producer, see D Mob. "Demobbed" redirects here. For the films, see Demobbed (1946 film) and Demobbed (2000 film). Demobilization or demobilisation (see spelling differences) is the process of standing down a nation's armed forces from combat-ready status. This may be as a result of victory in war, or because a crisis has been peacefully resolved and military force will not be necessary. The opposite of demobilization is mobilization. Forceful demobilization of a defeated enemy is called demilitarization. 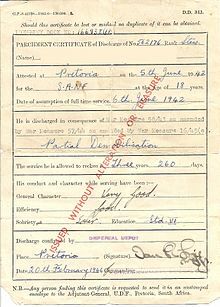 In the final days of World War II, for example, the United States Armed Forces developed a demobilization plan which would discharge soldiers on the basis of a point system that favoured length and certain types of service. 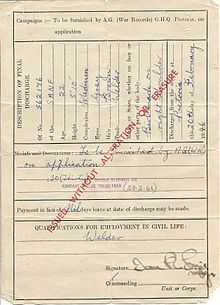 The British armed forces were demobilised according to an "age-and-service" scheme. The phrase demob happy refers to demobilization and is broadly applied to the feeling of relief at imminent release from a time-serving burden, such as a career. In the Russian language it is known as dembel and has become a certain tradition in the Soviet and post-Soviet Armed Forces. A United States equivalent is "short-timer's disease", comparable to "senioritis" among United States high-school students. ^ See Alan Allport, Demobbed. Coming Home after the Second World War, Yale University Press, 2009. This page was last edited on 11 March 2019, at 19:52 (UTC).